Most don’t realize how much actually goes into just simply opening and closing a garage door – until something breaks. 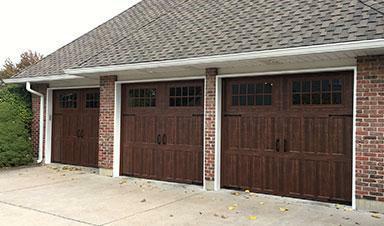 Damaged garage parts or doors can be a safety hazard and put those who use it at risk. Whether something goes wrong, breaks, or just isn’t operating like normal, let Royal Door help get your garage door running smoothly. Garage Door Spring Replacement: We offer fast and affordable springs replacement. Our spring replacements come with up to a six-year warranty. Torsion Spring Replacement: At Royal Door we make almost all residential torsion springs on site to ensure the size of your new spring is perfect and keep the repair costs low for your garage door. Our competitors may carry a few different sizes of pre-made springs and simply choose whichever is closest in size. However, this can reduce the spring’s life, the spring’s efficiency and proper functioning of the door. All our torsion springs come with an extended six-year warranty when replaced as a pair by Royal Door. Extension Spring Replacement: Royal Door carries most of our extension springs on hand to make sure your springs get replaced quickly and effectively. All springs that previously didn’t have safety cables will be added to ensure everyone in your home is always safe. This also prevents future damages to your property, including broken car windows! All our extension springs come with an extended six-year warranty when replaced as a pair by Royal Door. Cable Replacement: Royal Door makes all our cables onsite to ensure we always have the proper size for your door. This process also makes it much more affordable for you! All cable replacements come standard with a one-year warranty on the cable replaced. Pulley Replacement: Garage door pulleys (also known as sheaves) often wear over time and can seize up causing the door to malfunction. You will only find these on garage doors with extension springs, making it a good idea to replace them at the same time as your springs to help prevent any future issues from occurring. 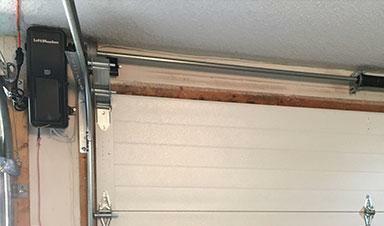 Roller Replacement: Does your garage door seem a little too loud or doesn’t run down smoothly? More often than not it’s because your rollers are worn out. Our replacement rollers are 10-ball bearing nylon rollers; some of the quietest rollers out there to provide the smooth operation you would expect from a new door. Garage Door Section Replacement: Did you accidentally drive into your door? Kids dent it with a baseball? Maybe even hail damage? Royal Door works with a large variety of door manufacturers to better support your needs for replacement sections. Replacing sections is not only the most affordable option, but also makes it so you don’t have to purchase a whole new garage door. Royal Door is here to make sure you don’t break the bank with your garage door repair costs. With us, you get the assurance of quality work and a reasonable price. Contact Royal Door to schedule your door repair today!